A carp fishing enthusiast hopes to hook a millionaire investor with his range of bait, while a brother-and-sister team are out to prove that they can turn waste into wealth. Dragons' Den is back in business for its 16th series as Peter Jones, Deborah Meaden, Touker Suleyman, Jenny Campbell and Tej Lalvani take their seats to face a fresh batch of entrepreneurs hungry to strike a deal. This episode's business hopefuls soon discover that the Dragons don't miss a trick as their financial strategies come under intense scrutiny. A carp fishing enthusiast hopes to hook a millionaire investor with his range of bait, while a brother-and-sister team are out to prove that they can turn waste into wealth. 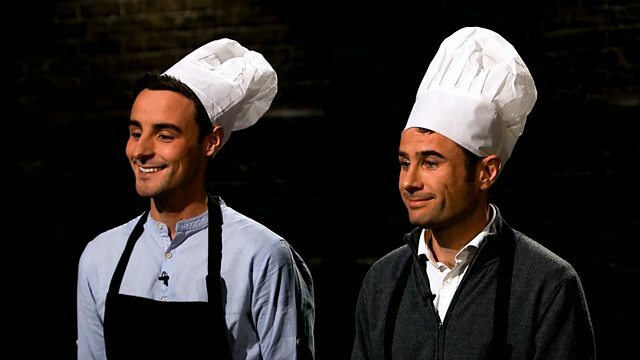 And two foodie entrepreneurs find themselves in hot water as they offer the Dragons a taste of their pasta home delivery business.